Hi and welcome on this page ! What is the Birth Diamond ? created by Eric Jackson Perrin in Lyon, France. It helps you become aware of who you are. As a spiritual being embodied in matter, you are a beautiful person who is like a raw Diamond seeking to shine through every one of its facets. When each facet is expressed in its best form, when it is experienced in full awareness so that it really belongs to you, then your "inner Diamond", wich is in fact your "spiritual body", shines more and more as you express the best of who you are. The Birth Diamond, or "Astro-numerological chart" is a graphical map of the soul’s structure. It combines the 12 astrological houses with various data from numerology, thus allowing representing an astrological chart in a numerological way. The different numbers obtained come to life though the images of the tarot cards.The name « Birth Diamond » and the structure of the tool were invented in 2011 in France by Eric Jackson Perrin (Coach in personal development, Astrologer, Mayan Astrologer and Yi-Jing Consultant). All life forms have a structure and all life is ruled by numbers and rythms. The Birth Diamond shows you, from a certain symbolic angle, your structure, your soul's evolutionary plan, your potential, how you express yourself, your ressources, your difficulties, your solutions and your evolutionary path. It describes your soul’s plan and architecture by showing 24 facets of yourself . It is like a bundle of keys that can open 24 doors of houses in your inner village in which you can “live”, because you have them inside you. The Birth Diamond can allow you to have a synthetic vision of your identity, of your needs, of your resources and of your challenges. It can show you where you come from, where you are and where you are going. It allows you to make connections between what you experience "inside" and the outside world. It shows your soul's goals and purposes. It cal help you make choices and to put actions into place so as to acheive the goals that match your true desires. This helps transform your life. You calculate your Birth Diamond by using your firstname, family name et date of birth. You can discover your Birth Diamond throught a mail followed by a phone session. A book "Discover your birth Diamond" is also available at kindle amazon. I wish you a very nice discovery! The "Birth Diamond can be displaced in two different ways. It's structure is a combination of the Maya system, of the astrological houses, of the spirit of Mister and Missus Hurley's Tarot deck, of a few elements from a tool called the Birth reference chart created by Mister Colleuil and of classical numerology. > Here is some more information about the Birth Diamond ! The Birth Diamond is a self-knowledge tool and a tool used for coaching and personnal growth. It can help you understand who you are. It allows you to express your full potential. It is available to all responsible people who wish to know more about their inner life and who wish to make the best of their lives. It describes your soul’s plan and architecture by showing 24 facets of yourself and a self-realization card. It is like a bundle of keys that can open 24 doors or like the inner village, with 24 houses in which you can “live”, that you have inside you and a card that summarises the Birth Diamond. The Birth Diamond can allow you to have a synthetic vision of your identity, of your needs, of your resources and of your challenges. It can show you where you come from, where you are and where you are going. The Birth Diamond comes from various Christian and Islamic traditions, which themselves come from India and China. It also comes from different English, American, Canadian and French cultural trends. This will be explained further down. It is a synthesis of different components that come from numerology and astrology. The Tarot Deck that i use is the Universal Tarot Deck created by Bruno de Nys. It is available at the publisher with the same name. The Birth Diamond is made up of two parts, the Diamond itself and its basis. The basis of the Diamond is the foundation on which the Diamond is built. On the left, you have the facets that are initially hidden until they are revealed. These facets are called "the soul's birth intention", “the Soul Call”, “the Hidden resource” “the Hidden Challenge” and “the Contradiction”. On the right, you have the dominant parts of the character, the visible core. These are psychological schemes and resources that are always available for you and that you always use consciously to do what you have come on earth to experience. Your visible core is made up of your natural temper, your deep motivation, your key resource, your expression number and your life axis or self-realisation number. The self-realization card describes a main psychological tendency and summarises the Birth Diamond. At the center of the Diamond’s basis, you have the “House of the year” or annual card. It describes the climate or dominant energy existing during the year. It is made up of the twelve astrological houses and of the source of brilliance at the center of the diamond. The definitions and the positions of the 12 houses are the same as in an astrological chart. House 1 or Ascendant : The state of mind that you have come to experience, the way in which you affirm who you are, the way you start things, your appearance, the image of yourself that you show to others, your weapons, your strength, the masks you put on to have “an ascendant” on the world. House 2: Incarnation, your wealth, your main resources, the way you handle matter, your relation to pleasure, to money and to your physical body, your artistic abilities or the way you put things into shape. House 3: Your way of thinking, of learning and of communicating, the way you adapt to your environement, the way you move and create movement in your life. Commercial intelligence. House 4 or « Bottom of sky »: Your origins, your roots, your family heritage, your well, your childhood and its conditionings, the subconscious mind, the dwelling place, the source of well-being, the places where you are natural and spontaneous. House 5: Your deep self, your personal marks, your awareness of yourself, your creative power and your creations, your ability to succeed, your will, the expression of your heart. House 6: Your technical intelligence, your adaptation to the world of matter, your sense of service, your search for well being, health and hygiene, recurring problems caused by a tendency to try and find solutions with the intellect. House 7 or Descendant: The way you engage into relationships with others, the couple, associations or rivalries, the opposite but complementary part of you, your antipode, how you go away from your center to meet others, the source of adversity that you must transform into an ally and the main challenge. House 8: What is hidden inside you, seeking initiation and your deep truth, the dark side of you that needs to be brought to light, the hidden treasure you have inside you, crisis and transformations, sexuality, the unconscious feminine part, discoveries and revelations. House 9: Finding one’s place in society, expanding your horizons, exploring space, travelling, studies, using authority and power to do your work, negotiation and business, your behaviour at your workplace, your philosophy or life, your spiritual research and beliefs. House 10 or “Midsky”: Your ambitions, the way you organize your destiny, your relation to structures and organizations, career, important achievements, the major lesson of your life, the path to yourself, seeking your deep truth and the laws of life. House 11: Expressing your specificity, experiencing group activities, adaptation to modern life and it’s technologies, friends, psychological evolution, experiencing helping and being helped, compulsory solutions that you must experience to free yourself, experiencing inner freedom, psychological et technological intelligence. House 12: What makes you suffer, the tests that make you grow, how you can transcend, spiritual evolution, your source of faith, ancestral and soul memories, mystical experiences, experiencing unity with God, the end of the story and what you leave behind. 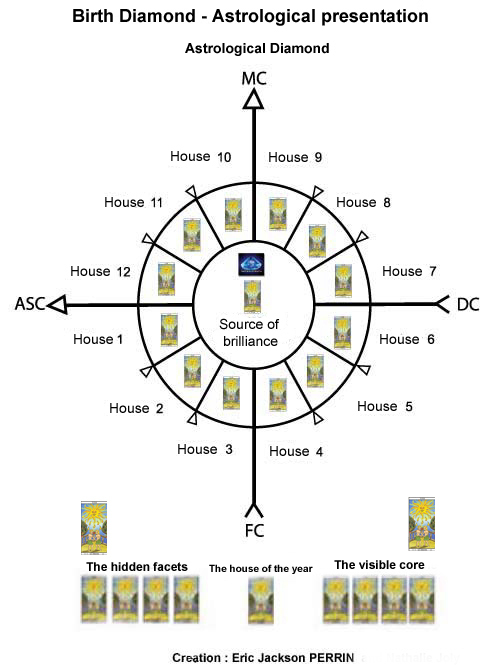 Each house is represented by "a symbolic tarot card" corresponding to it's number. History of the Birth Diamond ! The birth Diamond follows the flow of self-knowledge tools that have being created in the past decades. It was created in Lyon, France during spring 2011/2012. In China, there is a 3000 years old tradition that associates numbers with symbols. This tradition gave birth to a book called the I Ching, where 64 numbers are associated with the typical situations that come up over and over in human life. The modern Tarot is a “Christianised” version of the first 22 numbers of the I Ching. According to current known information, the first card games were created in China around the seventh century AD. These card decks were inspired by the existing Chinese symbols. The card decks rapidly reached India where they were adapted to Hindu beliefs. Trade between India and the Muslim empire, then in full expansion, allowed card decks to spread throughout the Muslim empire. The card decks were adapted to Muslim traditions under the Turkish Mamelouks, who runned the empire. One can find Muslim card decks from the ninth century AD. They are divided into 4 series of 13 cards (Jars, coins, spears and wands), with a Vizir, a vice Vizir and a queen. Crusaders and merchants, especially Spanish and Italian, brought these card decks back to Europe. They were then known as “Naib card decks”. Although many attempts were made by the Christian churches to forbid and banish these games, they became more and more popular, especially in Italy between 1300 AD and 1400 AD. It is thus in the towns of Italy that were created the first Tarot decks, which combined the classical card decks to which were added 22 extra cards or assets. According to Italian historians, these new tarot decks with 22 extra cards called “major Arcanum” or “triumphs” were created and financed by the ruling Italian families. The origin of the name “Tarot” comes from the Italian word “Tarocco” which itself comes from the Arab word “turuk” meaning “four paths”. This word was linked to Sufi groups, who were the religious elite of the Muslim religion. Many different tarot decks were created in a short time span, throughout all of Italy, between 1450 and 1550 AD. The best know ones were the Visconti Tarot, the Bologna Tarot, the Sicilian Tarot, the Parlanti Tarot, the Pasquinata Tarot and the Milanese Tarot. 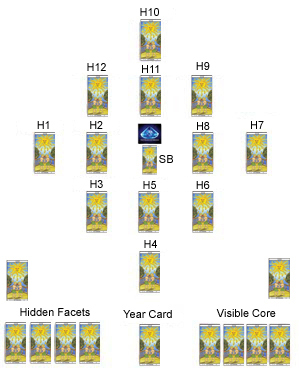 The order in which the cards were classified varied considerably until the order from the Milanese tarot decks was adapted as the official order. The “Tarot de Marseille”, used in France, and from which many tarot decks are based, was inspired by a Tarot deck created in Lyon in 1557 by a man called Geoffroy de Catelin who used a Milanese tarot deck. The tarot became more and more used, especially between 1800 and 1900, in France and in England. Various “truth seekers”, who called themselves “occultists” and who were inspired by Jewish and Christian traditions, used the tarot as a tool for predicting the future. In France at that time, a group of these “occultists”, amongst which were Mr De Gaita, Mr De Lorraine, « Papus » and Mr Oswald Wirth, created an organization called the “Rosicrucian Cabalistic Order”. They also created a tarot deck called the “Oswald Wirth Tarot Deck” and a spread with five cards called the Cross spread, which has the shape of a cross, a Christian symbol that was also the symbol of their organization. This spread became very popular in France and still is today. It helped Tarot cards to become widely used as a means to communicate with the subconscious mind. The tarot deck was strongly influenced by numerology since the very beginning of its making. The significance of each card highly depends on the number it carries. Numerology is the science of numbers. It is derived from mathematics and exists in Europe since antique Greece, mainly thanks to Mister Pythagoras. It is the art of giving numbers a symbolic meaning and then of interpreting these numbers by extracting information about a person’s life though his first name, family name and birth date. Numerology was well known to Muslim culture and to Jewish cabbala. Interest in numerology grew quickly, in England and in USA, between 1800 and 1940. In France, Mister Robert Markab helped numerology become popular with a first book written in 1938. In England and in France, the group of seekers who called themselves “occultists” naturally linked tarology and numerology. At that stage, the first component of a birth date, the day of birth, was linked with number one and symbolized the conscious personality asserting itself to live its life. That’s exactly what the Magician, first card of the tarot deck, does. The second component of the birth date, the month, was linked with the High Priestess, with the hidden part of the personality who holds all the keys and treasures that can grant access to the secrets and mysteries of life. The third component of the birth date, the year of birth, was connected to the Empress and to one’s ability to cope with the outside world, mostly though understanding of human nature and human laws and through intelligence and adaptability. These three components assembled together gave rise to a fourth component that was connected to the Emperor, who builds up his empire and accomplishes his destiny. And then the first four components were added together to give rise to a fifth component that gave a spiritual meaning to the first four components. This fifth component was linked with the High Priest and to the key teachings needed to find God. Numerology gradually grew with new indicators. Adding the day and the month of birth describes one’s inner personality and wealth (House 2 of the birth Diamond) while adding the month and the year of birth gives rise to how one uses one’s inner treasures to adapt to the outside world, to an outer personality and wealth (House three of the birth Diamond). Adding inner and outer wealth gave rise to one’s natural temper. Asking for the full name and for the birth date became a habit for most people using tarot. In 1974, at Sausalita in California, Jack and Rae Hurley, who practiced tarot, and illustrator John Horler, discovered Buddhism through a Tibetan Lama and experienced the “new age “ culture of the “60s” and “70s”. They created the « New Tarot Deck » or « Psycho-Tarot » which was published by Tarocco. This deck was made up of 78 black and white cards and it was specifically designed to help one solve difficult situations and psychological issues. The pictures and symbols on the cards were intended to help the consultant connect his conscious and unconscious minds so as to understanding why he personally created the situation he now experienced and how to solve his problems. A booklet, in which one can find a special spread called the “Diamond shaped spread”, was added to the card deck. This very thorough spread provides a complete overview of the consultant’s inner life in connection with a specific question. It helps one to set up and shape a healing process. The Psycho-Tarot combines therapeutical techniques such as Gestalt and Transitional Analysis with symbolic imagery and spiritual new age concepts. It rapidly becomes famous in USA and Canada where it is used by many therapists. The Diamond shaped spread has thirteen components or positions. These positions are linked to the planets and to psychological marks or indicators who show thirteen facets of inner life. 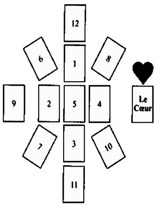 The positions are spread out on a table in a diamond shaped pattern. The number thirteen may have being chosen because there are thirteen cards in each of the four families that make up most card decks. It is also quite possible that thirteen was chosen because of the Mayan calendar and its soul cycle, divided into thirteen parts. His calendar was booming in the “70s”. 1- Position of the Sun: the center of my world right now. 11- Position of Vesta: what is missing? Mr and Mrs Hurley's "Diamond spread"
She graduated in psychology at the University of Montreal in Canada. She became a therapist as well as a teacher. She was fascinated by altered states of consciousness, by parapsychology, tarot and personal growth. She did research in various clubs and in 1977, she opened a practitioners office called the “Ressourcement Psycho-Tarot”, were she used Hurley’s psychological tarot deck for individual sessions, in Canada. She gave many conferences in North America and in France. In 1993, she founded the « College international du transpersonnel », an international training center for therapists who which to learn how to handle the concepts and tools of transpersonal psychology. She also wrote books, amongst which is the bestseller “Tarot Psychologique, Miroir de soi”, published at the “Editions Mortagne” in 1988, were she explains how to use Hurley’s « New Tarot Deck » during a therapeutic process. Her research, conferences and books helped many people get a greater insight on how to use symbols and tarot cards as tools in a therapeutic practice. French speaking people were then able to learn how to use tarot cards as therapeutic tools. In the south of France, he studied philosophy, psychology and linguistics. He also studied mythology, la numerology, alchemy, tales as well as art and world culture. He taught philosophy, literature and psychopathology in Nice and Cannes. In 1988 he founded a club called « Hommes de Paroles », so as to help suffering children. He became a psychotherapist and a teacher in communication. He is an explorer of all human knowledge and a passionate seeker in personal growth. He invented different self-knowledge therapeutical tools such as the Mythogramme, the Onomasophie and the Birth Reference Chart. He published many books at Arkana and Dangles, amongst which are “The inner fountain”, “The therapeutic role of symbols”, “The Birth reference Chart”, “Tarot treasure island” et “The practical guide to the Birth Reference chart”. He taught many therapists and people interested in personal growth on how to use his different tools. His insight, his intuition, his experience in dealing with human nature and his research in numerology enabled him to find and combine various formulae. The Birth Reference Chart has thirteen “houses”. It combines the practice of numerology with therapeuthical techniques that call upon the psychological tarot. House 1: My personality, the picture of myself I show to others, my symbolic business card. House 2: My unconscious motivations, my unconscious quest. House 3: My mental filters and processes, my way of looking at the world. House 4: My life task. House 5: Obligatory actions, what I must confront in order to grow and move on. House 6: My main resource. House 7: My main challenge. House 8: My personal year, my annual card. House 9: My deep self or my deep identity. House 10: recurrent problems, experiencing failure until psychological healing is experienced. House 11: Family legacy, parent’s ideal of my life, atmosphere at birth. House 12: Final destination, my healing, what I will leave behind to future generations. House 13: The main paradox at the center of my soul that combines a major problem with a powerful resource to overcome the problem. The Birth Reference Chart became, since the 1990’s, a therapeutical self-knowledge tool used by many therapists and coaches to assist those who come to see them. Thanks to these wonderfull people, our civilization progresses towards more awareness ! Just like your spinal colum has 24 vertebrae, so your soul has 24 main "houses" or inner spaces ! As all human beings created by the Source, you are a Diamond that wants to shine. This can be done by being aware of all your facets and by expressing them in the best possible form. In this session, we will see your different facets and how you can best express them.